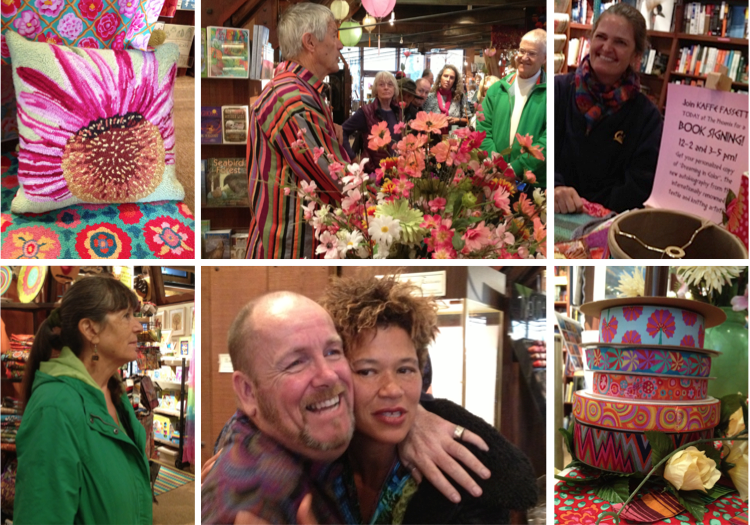 One of the highlights of my year was celebrating the publication of Kaffe Fassett's autobiography: Kaffe Fassett: Dreaming in Color. 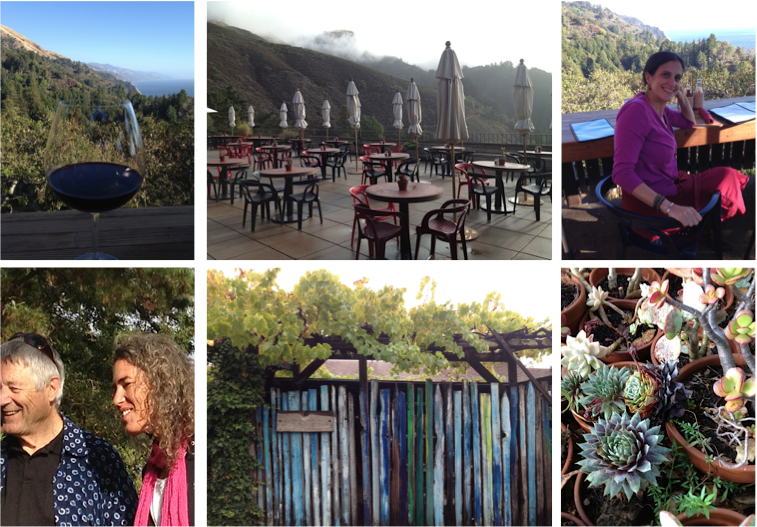 Kaffe spent much of his childhood in Big Sur, California, where his parents built the famous Nepenthe restaurant. The wild California coastline and the bohemian cast of characters who passed through Nepenthe made a significant impact on Kaffe's view of the world and so, when it was time to organize a book tour, we knew we wanted to have an event there. And I knew I wanted to attend the celebration! Kaffe shared the news with his family, and they welcomed me so warmly that I felt like I somehow belonged. I had spent hundreds of hours working on the book and then, before my eyes, it seemed to come to life. Everything was new to me yet it was familiar--the original log cabin, the artwork on the walls, the food, the landscape, the view, the people. I snapped a bunch of photos with my phone. They don't provide a comprehensive look at the event or the place but I do hope they portray the joy of the experience! Above: Kaffe signing books. Despite a pretty serious rainstorm, friends, family, and fans happily made the trip to the celebration. Above: The signing took place inside the Phoenix Shop at Nepenthe. The two-story shop sells a selection of Kaffe's work as well as the work of other family memebers, plus an eclectic treasure trove of clothing, jewelry, homewares, and books. That's Kaffe's niece Erin at top right, his sister Holly on the left side of the second row, and his partner Brandon and niece Winona in the bottom center. Above: Around the idyllic property. That's me in the pink sweater, and Kaffe and his niece Romney in the bottom row. Behind that painted wooden fence is the original log cabin, where family members still reside. At top center is Cafe Kevah, another casual eatery on the property. As soon as we arrived Romney ordered me a glass of Gary's Lucia Pinot Noir from a nearby vineyard. Seven hundred feet above the Pacific, the scene was set. Perfection I will never forget. And so, it is with this special memory at the forefront of my mind, that I look back at 2012 with gratitude and look forward to 2013 with hope.